York striker Michael Rankine says he is delighted to be back, after making his first start since returning to the club in Tuesday's 0-0 draw with Gillingham. 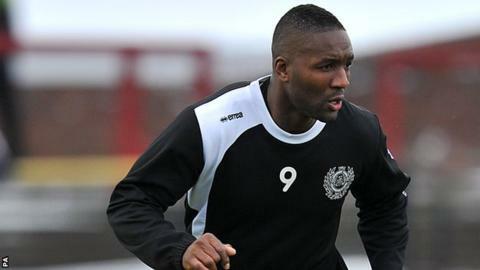 Rankine, 28, signed on loan from Aldershot on Tuesday, returning to the club he left in 2011. "My manager [Dean Holdsworth] rang and said York wanted me. Really, it was a no brainer," he told BBC Radio York. "It's been brilliant. I'm happy coming back up north to where I belong - it feels good to be home." Rankine scored 24 goals in 103 games during his first spell between 2009 and 2011 before joining Aldershot. He believes the current crop of players can take heart form last night's display against table-toppers Gillingham. "They're top of the league, and there was nothing between us," he said. "We've got to take away that there's no reason we can't be up there too." The Doncaster-born striker also revealed he completed the full 90 minutes despite not being match-fit. "I've hardly played this season, five minutes here and there is no good for me - I'm nowhere near fitness," he added. "Every game I'll get fitter and sharper. I know I'll have to sit out some games but I'm looking forward to working hard as part of this squad."